When Starfire signs the team up for the popular reality show, Jump City's Got Your Talent Right Here! 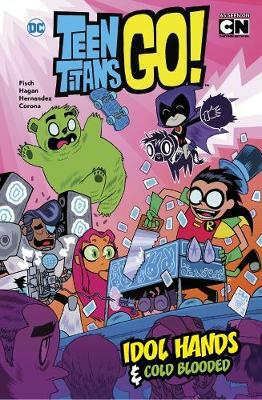 Robin becomes obsessed with showing the world just how talented the Teen Titans really are! Then, after a fight with Captain Cold, Robin comes down with a cold himself! Running a... read full description below. When Starfire signs the team up for the popular reality show, Jump City's Got Your Talent Right Here! Robin becomes obsessed with showing the world just how talented the Teen Titans really are! Then, after a fight with Captain Cold, Robin comes down with a cold himself! Running a high fever and quarantined from the rest of the Titans . . . the madness begins to set in!